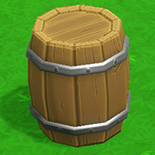 The explosive barrel is an object which will deal damage in a radius of six voxels around it when detonated. Other explosive barrels within these six voxels will also detonate. Explosive barrels must be built on a flat surface, on the ground, on bricks or on a log, even on planks. The Explosive Barrels can be crafted in a Laboratory and requires 1 Plank and 10 Brimstone to be crafted. In order to move a barrel, select a Bricktron and right-click the barrel. To deposit it, select the Bricktron and open the radial menu where you'd like it to be deposited. The radial menu is opened by holding right-click. Explosive barrels can be detonated in various ways. It can be fired at by an Archer, Arbalist or Alchemist via the radial menu, causing it to detonate. A wick can also be lit through the radial-menu by a Bricktron. It will detonate after six seconds, giving the player enough time to move the Bricktron to a safe range. Explosive Barrels can also be loaded in a catapult and flung at a large range. In multiplayer PvP, enemies can also detonate barrels a player has stockpiled in their base, so protecting your explosive barrels is recommended. A well placed enemy archer could take out your entire stockpile of explosive barrels. Some players will not only place their explosive barrels indoors to avoid unwanted detonations, but also leave more than six voxels between each barrel, to avoid a chain reaction if one is inadvertently detonated.